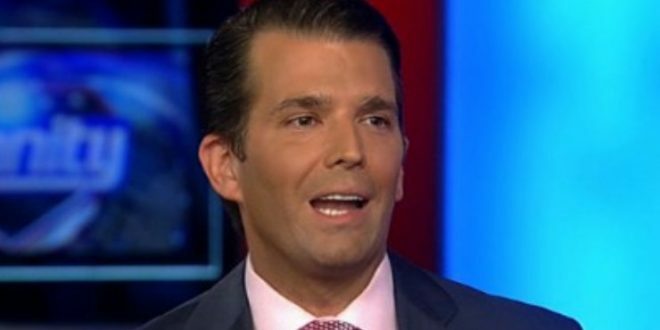 Junior Testifies Privately Before Senate Panel As Dem Senator Warns He Could Face "Years In Prison" [VIDEO] - Joe.My.God. The oldest son of President Donald Trump arrived on Capitol Hill Thursday morning for a private interview with congressional staff about a meeting he had with a Russian lawyer during the 2016 presidential campaign. Trump Jr.’s appearance marks a new phase in the Senate’s investigation and reveals continuing interest in the June 2016 meeting at Trump Tower. Emails he released in July show that Trump Jr. was told before the meeting that he would receive damaging information about his father’s opponent, Democrat Hillary Clinton, as part of what was described to him as a Russian government effort to aid his father, the GOP nominee. Blumenthal issued a pointed warning saying it was still a “code” violation to lie to a U.S. Senator and doing so could result in “several years in prison” for the real estate heir. “What are the penalties for Donald Trump Jr. not telling the truth? What are the rules that you all have set around his testimony?” asked Morning Joe’s Willie Geist.